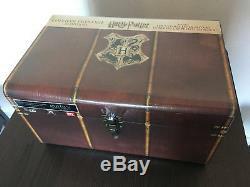 Collector box harry potter prestige edition limited and numbered (No. The object is new (unopened) and blistered. Harry potter at the wizard school. Disc 1 (blu-ray): movie version and long version + bonus. Disc 2 (dvd): cinema version. Disc 3 (blu-ray): "the creation of the world of harry potter 1st part: the magic begins". Disc 4 (dvd): special edition bonus - Harry Potter and the Chamber of Secrets. Disc 5 (blu-ray): movie version and long version + bonus. Disc 6 (dvd): cinema version. Disc 7 (blu-ray): "the creation of the world of harry potter 2nd part: the characters". Disc 8 (dvd): special edition bonus - harry potter and the prisoner of azkaban. Disc 9 (blu-ray): cinema version and long version. Disc 10 (dvd): cinema version. Disc 11 (blu-ray): "the creation of the world of harry potter 3rd part: the creatures". Disc 12 (dvd): bonus of the special edition - harry potter and the fire cup. Disc 13 (blu-ray): cinema version. Disc 14 (dvd): cinema version. Disc 15 (blu-ray): "the creation of the world of harry potter 4th part: the sound and the music". 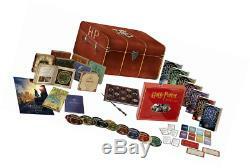 Disc 16 (dvd): bonus of the special edition - harry potter and the order of the phoenix. Disc 17 (blu-ray): movie version + bonus. Disc 18 (dvd): cinema version. Disc 19 (blu-ray): "The creation of the harry potter world Part 5: Evolution" - Harry Potter and the Half-Blood Prince. Disc 20 (blu-ray): movie version + bonus. Disc 21 (dvd): cinema version. Disc 22 (blu-ray): "the creation of the world of harry potter 6th part: the magical effects" + other bonuses - harry potter and the relics of death - 1st part. Disc 23 (blu-ray): 2d movie version + bonus. Disc 24 (dvd): cinema version. Disc 25 (blu-ray): "the creation of the world of harry potter 7th part: the story" + other bonuses. Disc 26 (blu-ray 3d): active 3d movie version - Harry Potter and the Deathly Hallows - Part 2. Disc 27 (blu-ray): 2d movie version + bonus. Disc 28 (dvd): cinema version. Disc 29 (blu-ray): "the creation of the world of harry potter 8th part: grow" + other bonuses. 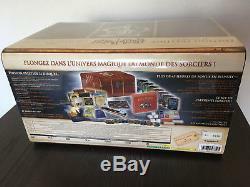 Disc 30 (blu-ray 3d): active 3d cinema version - the 7 books editions folio junior gallimard - the board game harry potter travel format - catalog of accessories of the saga (48 pages) - catalog of labels (13 x 18 cm - 32 pages) - Hogwarts card and its printed environment (61 x 91.4 cm) - the elderberry stick. The item "limited edition harry potter box limited edition number nine" is on sale since Monday, October 15, 2018. It is in the category "dvd, cinema \ dvd, blu-ray". The seller is "baquang" and is located in montpellier. This item can be shipped to the following country: France.